The Sharp ER-A280F was designed from the ground up with a compact form factor in mind. The register can be removed from the cash drawer making giving it a small 210 x 310mm footprint. With its multi line backlit LCD display is an easy and comfortable machine to correct errors and read back through a sale. 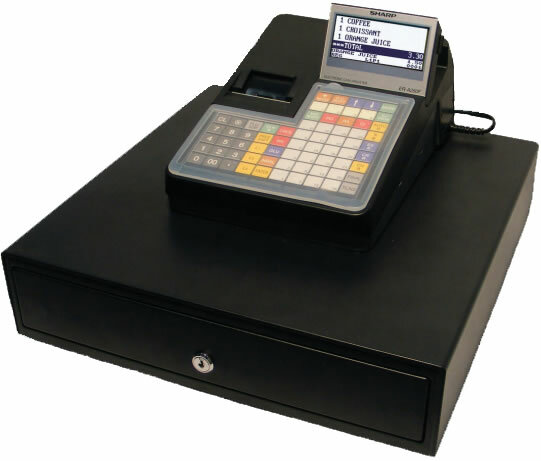 Popular with retail shops the ER-A280F has connectivity to barcode scanners. Its quiet and reliable thermal printer produces easy to read and detailed receipts containing the business details including the G.S.T. in the header message. The machine was designed with the end user in mind to be hassle free to program and sell with. The ER-A280F can also store data on an SD memory card through a slot located on the side of the cabinet.